I got to thinking about yesterday’s post. While I was chopping the butternut squash for that wonderful soup I rustled up, it dawned on me that I hadn’t eaten much of this particular winter squash over the years. I was struck at first by the smooth, hour-glass figure of the butternut squash. I had to admire this pear-shaped beauty – so classically Rubinesque! And the insides – an easy swipe of the knife yielded two halves of surprisingly soft velvety texture, richly orange in colour. 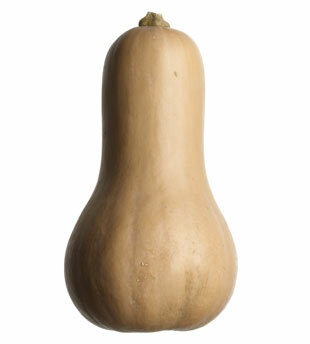 But aside from clearly outranking most other squashes on the beauty front, the butternut squash has so many nutritional benefits to offer. Let me share a few. That rich orange colour I mentioned? This pigment stems from carotenoids, which are powerful antioxidants that can help prevent some forms of cancer and heart disease, and act to enhance the immune response to infection. 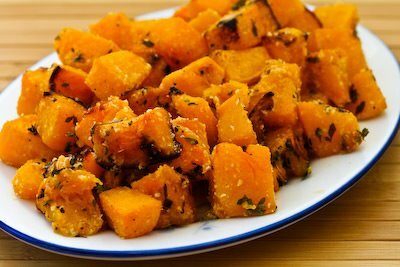 Butternut squash is particularly rich in beta carotene, which helps the body make vitamin A. Vitamin A is important for increasing anti-viral activity, maintaining healthy linings of your digestive and respiratory tracts and skin, and improving bone and eye health. It can be a deterrent against age-related macular degeneration. 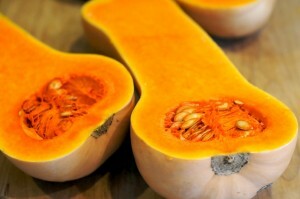 Butternut squash is low in calories and high in dietary fiber, both soluble and insoluble. Soluble fiber dissolves in water to form a viscous, gel-like substance, and slows the rate at which digested food leaves the stomach. This keeps us feeling full longer and keeps blood sugar levels stabilized, reducing the risk for diabetes. Soluble fiber also normalizes and maintains healthy cholesterol levels. Insoluble fiber promotes efficient digestion and bowel regularity. A powerful antioxidant that boosts the immune system, vitamin C helps with wound healing and gum health. Vitamin C synthesizes, maintains and repairs skin, blood vessels, cellular tissue and bones. It inhibits the ability of free radical compounds to damage DNA. Cooked butternut squash provides 40 percent of the RDA of vitamin C per ½ cup serving. Potassium in the diet lowers blood pressure, a major risk factor for stroke and heart disease. It bolsters bone strength by helping guard against bone loss, and helps to reduce the risk for kidney stones. 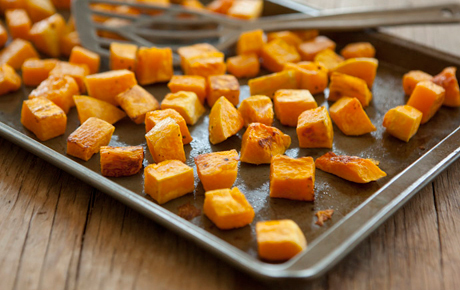 One cup of baked butternut squash has 900mg of potassium – bingo! The list doesn’t end there: butternut squash provides vitamin B6 to enhance function of nervous and immune systems, manganese to chase away free radicals, and folate to guard against brain- and spinal cord-related birth defects. At 80 calories per one cup serving, butternut squash is definitely a go-to food to keep weight under control over the long winter season! Preheat oven to 350 degrees. Peel, remove seeds, and chop squash into bite-sized chunks; place in large bowl. Add coconut oil, lemon juice, thyme, sea salt, and pepper. Toss to coat. Pour bowl contents onto baking sheet. Bake in oven until fork-tender, about 30-40 minutes. Remove from oven and toss with nutritional yeast (or parmesan, if you opt for dairy).